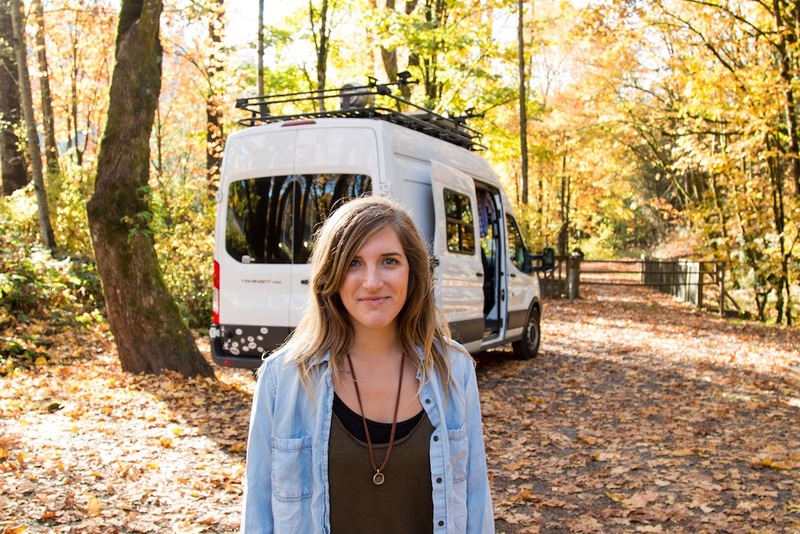 Laura Hughes is a full-time traveler, living on the road in her campervan, Vanna White. She’s also the host and co-producer of the podcast Women On The Road, a series telling honest stories of life on the road from the feminine perspective. This is Hughes’ life now. But three years ago, it looked drastically different. Before hitting the road, Hughes lived in an apartment in Seattle, had a full time job in human resources, and was working on a variety of passion projects to keep her busy in her free time. Her weekends were reserved for the outdoors, when she and her boyfriend Shane would trade in their city life for the mountains of the Pacific Northwest. It became such a regular routine that they outfitted Shane’s Toyota Landcruiser with a bed, storage system and window shades so they could make the most out of every last minute outside. And that worked—for a while. Over time though, their desire for more space and a longing to travel farther and longer led to the discussion of buying a van. The conversation organically evolved to living on the road full time. 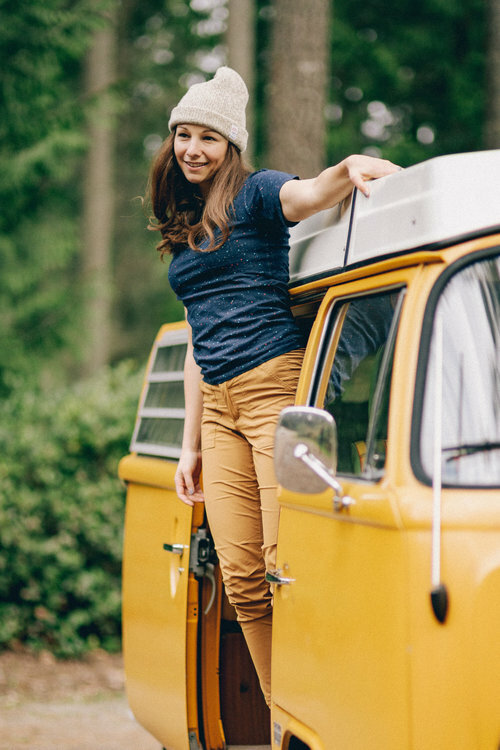 Scrolling through images of converted vans trucking down dirt roads and handmade homes with views of mountain ranges, she found Gale Straub, founder of the online community She Explores. 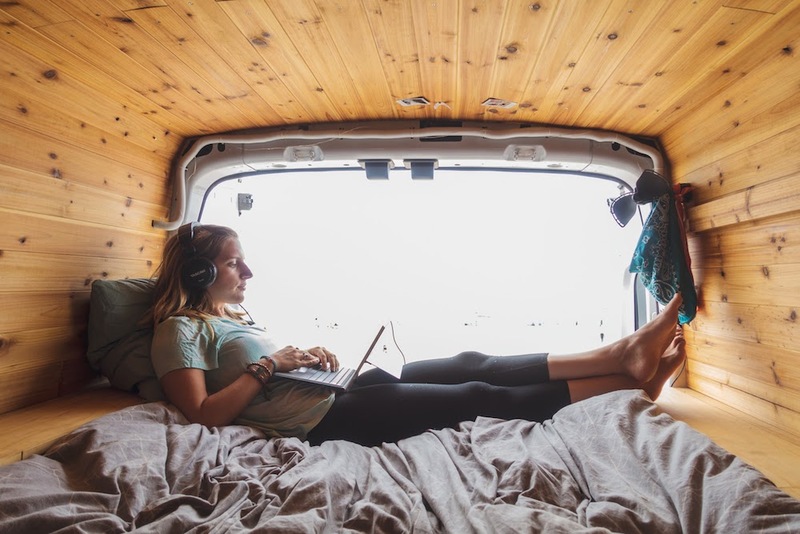 At the time, Straub was living full time in a converted Sprinter and interviewing women for an online interview series called “Women on the Road.” The timing was serendipitous. Hughes instantly resonated with these women and their stories, and admired how they made living life on the road their own unique adventure. 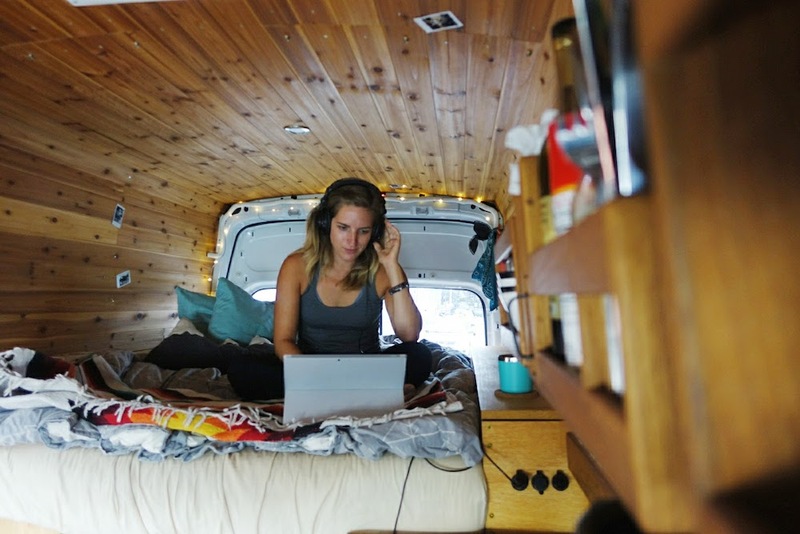 With each story and 1-inch square photo, she saw there was a growing community surrounding van life, and her courage and determination grew. When the time came to purchase a van, Hughes and her boyfriend decided on an empty white 2015 Ford Transit 250, and promptly named her Vanna White. Buying Vanna new allowed them to customize her according to their lifestyle. They had a few objectives: stay clean and warm, eat healthy, and have room to stretch out. With those goals in mind, they got to work converting their empty van into an adventure-mobile. When all was said and done, the couple had added insulation, walls, storage, flooring, a kitchen galley, a bed, a roof rack, a solar power system and an electrical set up to Vanna. 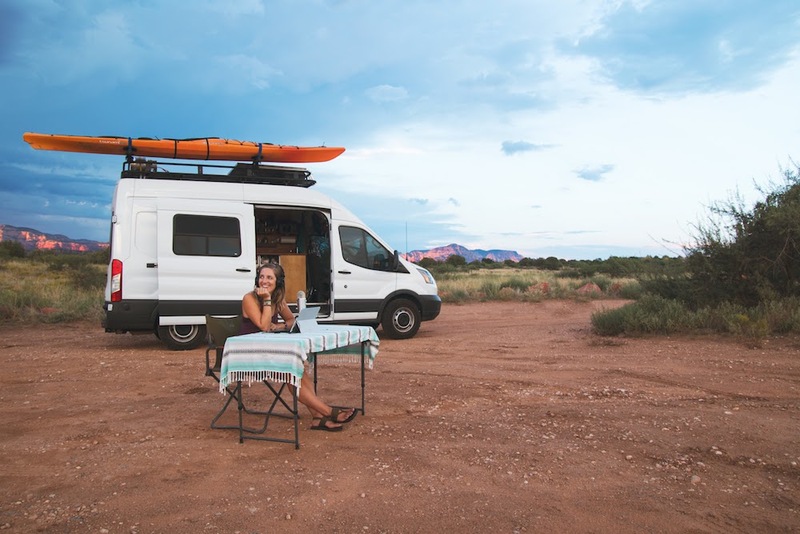 Since they had no experience with the massive undertaking of building out a camper, they took their time and spent over two years planning, saving, and executing the van conversion. With Vanna complete and goodbyes to friends and family said, it was time to hit the road. With her HR job behind her, Laura started to desire a new creative project to immerse herself in. She approached Straub and asked her about starting a podcast as an extension of the Women on the Road interview series. Straub was taken by Hughes’ genuine passion for the lifestyle and gave her the green light. Having never hosted a podcast before, Hughes dove headfirst into the endeavor. The Women On The Road podcast is now in its second season with more than 25 episodes available for download. Topics range from navigating relationships in tight living quarters, financing road travel and finding the right adventure-mobile, to spotlighting what it looks like to work while traveling. As the host of the podcast, Hughes says she feels honored to give back to all those female travelers who have stories to tell. 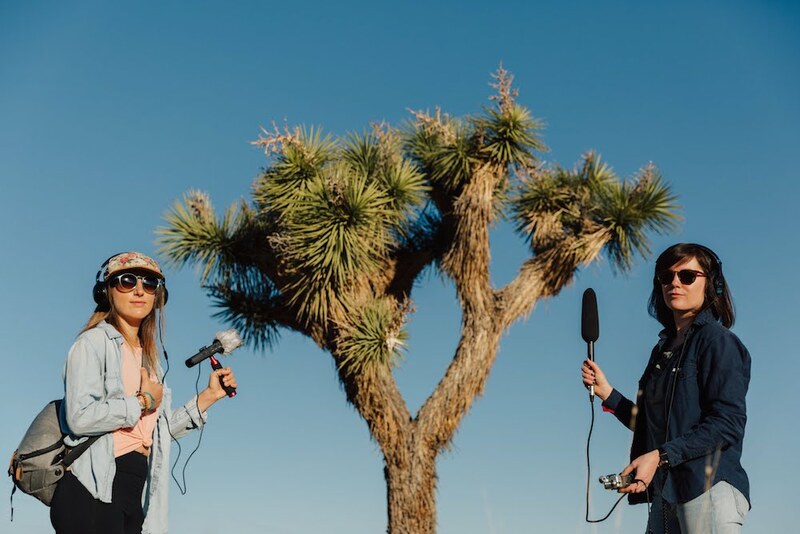 “Hopefully [the podcast] inspires other women out there to say ‘yes’ to the kind of adventurous living they’ve been dreaming about,” she says. Listen to the Women on the Road podcast and follow Hughes’ adventures on Instagram and online. Image courtesy of Laura Hughes.